Directed by Anja Kofmel and screened during Cannes International Critics Week in 2018, this feature length documentary ,which fuses a mix of live action, archive and animation, is a remarkable investigation into the death of war journalist Chris, Kofmel’s late cousin. This personal story, rich with emotion explains how the death of Kofmel’s cousin has impacted her entire life. Chris travelled to the Croatian War of Independence in the 90’s, and much of the film is set in and around Zagreb. 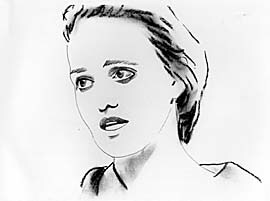 Kofmel appears herself in the film both as a child in animated form and as an adult in live action. We see her visit the places Chris had been, such as hotels and battle grounds and talk to the people he met, such as fellow journalists and ‘soldiers’, in an attempt to discover why and how he died. I thought the inclusion of the animation production process as part of the film was a nice touch, the storyboarding and concept sketches forming part of her search. The animation is spellbinding, black and white 2D and created in TV Paint, there is the feeling of movement and texture in the drawings as the ink bleeds into the ‘paper’ whilst images are formed and animated. The depiction of Chris and other characters is very clear, the characterisation of them and Kofmel’s direction holding up well against any photos or live action of those people. In particular the key characters, not alive today to give testimony, the animation is adding and ‘filling in’ for the missing live action that we require in order to tell Chris’s story. But the animation is not merely a device for the live action. It brings a new level of understanding to the documentary in the way in which it morphs, transcends time and geographical boundaries. There are symbolic themes in the animation, such as that of the animated lines that denote the lines in Chris scarf, or the black painterly marks that follow Chris, which instantly make me think of death. These devices guide us through the narrative, and act as signifiers of important events. The animation explores memory, loss and emotion and through it’s movement is evocative of all these states. A wonderful film, truly deserving of its critical acclaim. In my opinion, this is a fine addition to the animated documentary genre. Seven renowned animators have been selected to create a series of micro-shorts, commissioned by Animate Projects and Anim18, as part of the Anim18 programme – a UK-wide celebration of British animation taking place until December 2018. Working in collaboration with other creative talents and a range of subjects, the animators reflect on the collective and individual experiences of people living in the UK today. They are playful, joyful, and eye-catching gems, designed to be discovered in the viewer’s Instagram feed, that they will want to share, repost, like, and comment on. Together the films present an exciting and vibrant collection of stories exploring cultural heritage, historic curiosities, devoted communities, and ways individuals navigate modern life: Leo Crane’s film offers a platform to an adopted child to share his fantastical and hopeful dreams; Ian Gouldstone takes inspiration from the inhabitants of the tower block he resides in; and Osbert Parker and Laurie Hill consider the curious tale of a wasp brought into Victorian society and cultured, and how her treatment reflects on contemporary life today. Several of the films center on the cultural communities that the animators belong to: Anushka Kishani Naanayakkara reflects on the motivations of visitors to a Buddhist Monastery that she frequents; Kate Sullivan invites us into a meeting of the 3D enthusiasts club she takes part in; and Jessica Ashman’s film celebrates the importance of participating in Carnival culture for herself and her peers. The films will be launched on Instagram and Vimeo throughout November, beginning with Hold Tight by Jessica Ashman on Tuesday 6 November. Nautilus is an online magazine which features weekly Science topics and explores them through a variety of media including essays, blogs, animation and videos. They feature numerous animated documentaries or live action docs with animated segments on exemplary scientists and their contribution to the world of science knowledge. With the next Ecstatic Truth symposium coming up on Saturday, this seems like a good time to revisit last year’s event and share the recordings of the jam-packed schedule of speakers, workshops and networking. Ecstatic Truth: Lessons of Darkness and Light is the second animated documentary symposium at the Royal College of Art, London, on Saturday 26th May 2017. Well we have had a fabulous year to date so far here at animateddocumentary.com. Particularly with the addition of our two contributors Alex Widdowson and Charlotte Kaye. Charlotte has now moved on to other things, but we are thrilled that Alex has continued to write for the blog and we hope that he will stay with us next year. Our other news is that both the co founders of Animateddocumentary.com are soon off to have a baby each! And so Alys, Ellie and Alex will be taking a short break from the blog. We have however been working hard to ensure that you, our readers still have your weekly dose of anima doc posts. So we have scheduled some exciting reviews for the following three months to keep you all going. A special thanks to Alex for getting some fabulous reviews and films together in a short space of time for our maternity leave! If you want to get in contact with us over the next three months, please do so by leaving a comment here or on facebook. It may take us a little while to respond. As always we really welcome your comments, thoughts and suggestions for the blog. We will be back in January 2014 with more exciting anima doc news. On 25 April 1995 16 year old Matthew Easdale was shot in Brisbane. His mother was interviewed on the radio. Using rotoscoped animation the film presents the story in two very different ways. There are several clips of the film on Dennis’ website at http://dennistupicoff.com, and the film is included on the Animating Reality DVD.